The process of creation of a new product or services together with its implementation and product launch is in general a good candidate for being handled as a project. Main objective of product management is to ensure that the desired results are realized under the three constraints cost, time, and scope. 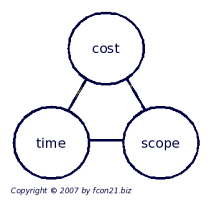 Those constraints are also called “project management triangle”. Neither of the constraint can be changed without effecting the others. The exact correlation of those constraints varies from project to project, but in general the factors are competing. But for example, an increased scope requires more time and money, less money means longer project time or reduced scope, etc. A successful project manager will be able to envision the entire project from start to finish and lead the team efficiently using tools and techniques of project management. Project management deals a lot with social factors. Finally it is people — the team — who create the success or failure. A good project manager will be a leader, who guides and motivates the team. He will pay attention to the social undertones and react accordingly. In our opinion leadership contributes more to the success of a good project manager than domain specific skills. There are literally hundreds of different project management tools and software programs on the market to choose from. Many project offices and project owners believe that the more tools, report forms, etc. they use the better will be the outcome. At the end the team members end up getting stuck in filling out those reports, don't get their work done and loose their motivation quickly. In many organizations employees do project related work on top of their usual work load and probably work in more than one project at the time. Project management tools should be employed depending on the actual needs of that specific project. They should not be a burden. We can observe many reasons, why some projects perform badly or fail to achieve their goals. We have summarized some typical areas of problems, which are sometimes overlooked by even experienced project managers and owners. Make sure that your project does not lack in the following aspects. “It is about people” — A project manager is responsible to the project owner, but he also has to support his team. Especially in difficult situations. Whenever an external or internal change effects the project one must act quickly. “Time constantly erodes alternative paths for reaction.” The longer you wait, the less you can do about it. Only in very rare cases you may “sit out” the problem without damage. Too often new employees are delegated into projects. They might have fresh knowledge from college, but a solid lack of experience and good-standing within the organization. Each organization and each person has a different preference for type of communication. Also different situations require different forms of communication. The project organization should build as necessary on top of this “natural flow”. An inprecise definition of the project's goal does let too much room for individual expectations by management, team members, etc. A good and complete definition helps to avoid unnecessary conflicts. Always keep the “project management triangle” in mind. Nobody wins at the end, if the proposed schedule, budget, and scope is within the range of what the corporate management might wants to hear, but will not standup against reality in long term. Good luck with your project or contact us now to get on the right track fast or continue reading about Consulting & Coaching.